Where Does Santa Live? Ask his Grumpy Elf! I'm Santa's Grumpy Elf and right now I'm grumpy because I'm all out of cookies (again!). 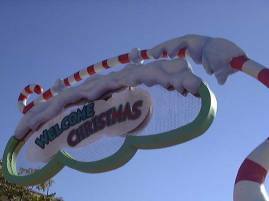 Santa's main home is The North Pole (of course, silly!) -- in Canada. Do you want to know more about where Santa Claus lives? Well keep reading then! Everyone knows Santa Claus lives at the North Pole! But where exactly in Canada is it? After all, there is more than one North Pole in Canada! (Ssh! I didn't tell you that!) Well, that's another one of Santa's secrets. There's the cold, cold North Pole at the Top of the World . But people forget there's also the Magnetic North Pole. Could it be that all those compasses point to Santa's Worksho... er... the Magnetic North Pole for a reason? I'll never tell! Ok, ok, Santa Claus does have other places around the world. I'll tell you about them too. (Why do I suddenly feel a bit like his travel agent?) He does visit them every year (kind of like having summer homes -- does he think he's Brad Pitt or something?) But I like staying at the North Pole. I'm nice and grumpy right here, thank you! Many years ago, Santa Claus built a Christmas House (Julehuset) right next to the town square in Drøbak. Just watch out for elves crossing the road! This is Santa's original hometown! It's called Demre now. It's where Saint Nicholas was born when he was only known as Nicholas. He doesn't get back there as often any more. But, I figured you'd want to know about it anyway, otherwise you'd be grumpy with me. 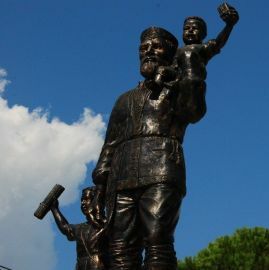 They do have a nice statute of him there. Did you know Santa Claus even has a home in China now? In a lovely national park he always finds the time to visit with children. I just hope he doesn't outsource all the work to the Chinese elves! They did make an amazing ice sculpture though. I'm just grumpy I'm not good at ice sculptures. Guess I'll just stick to making Snow Grumpies (that's what I call snow angels ). Another one of Santa's homes is near Mora, Sweden. Of course, he usually goes by his Swedish name there, Jultomten, or Christmas elf . His home is deep in the woods near the Gesunda mountains. In the 1940's, Santa set up a small place in Alaska. Soon other people moved in too. 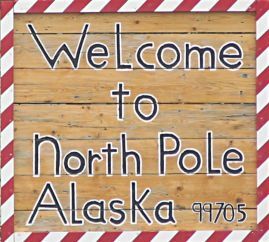 Because everyone loved Santa so much, they decided to call the area North Pole, Alaska. Even though I'm a grumpy elf, I do like all the street names in North Pole, Alaska. There's Santa Claus Lane, St. Nicholas Drive, Snowman Lane, and Kris Kringle Drive. One of these days the elves are going to challenge that North Pole Babes in Toyland roller derby team to a match too! 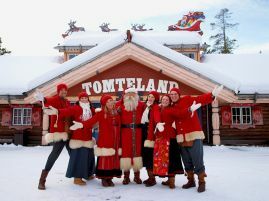 Children in Denmark and Greenland know that Santa has a secret home near Kongsgården in Greenland. Santa has a little house by the sea with wonderful snowy meadows for the reindeer. This little fellow is learning to fly already. I just wish I wasn't the one that has to catch them when they fall. Santa has had a place in a small hamlet in the Adirondack mountains since the 1940's. I don't know if it's changed much. But, I think he likes it there because he likes white Christmases. And North Pole, NY is one of the best places in the U.S. Northeast for that! There's a 96% chance of snow every Christmas season. And there's a 96% chance I'll be grumpy again tomorrow! Children in the Netherlands know that Santa has a secret home in Spain. 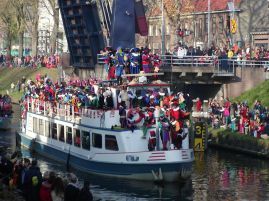 In late November every year, Santa puts on his Saint Nicholas clothes and takes a special boat to the Netherlands. He rides a white horse and checks to see who is being nice. Too bad he never takes the elves (but I think I'd melt in Spain anyway). This is one of Santa's fav places. There's lots of reindeer around and even a special mountain. 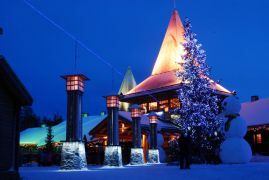 Santa's secret home was revealed in 1927 on the popular Finnish Children's Hour radio show by Uncle Markus , Markus Rautio. Uncle Markus explained about the special mountain called Korvatunturi or Ear Mountain . The mountain looks like a big set of rabbit ears. Of course, the elves figured out long ago how to use the ears to listen to which children around the world were being naughty.